‘What I dream of is an art of balance, of purity and serenity, devoid of troubling or depressing subject matter, an art which could be for every mental worker, for the businessman as well as the man of letters, for example, a soothing, calming influence on the mind, something like a good armchair which provides relaxation from physical fatigue’, said Matisse. 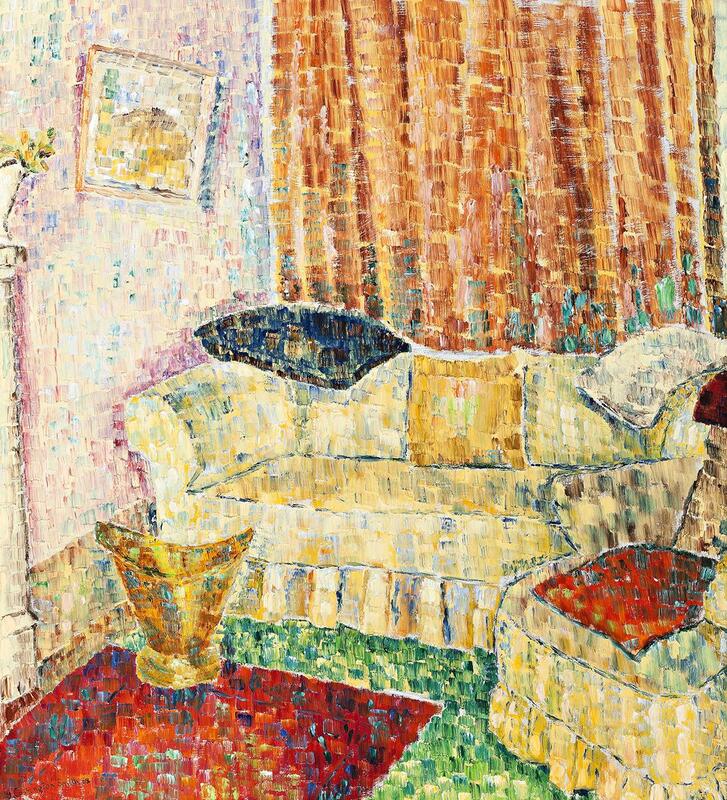 Grace Cossington Smith provides the armchair – a sofa too – in a painting of purity and serenity. Sofa and chair were in the living-room of the artist’s Turramurra home. They were oddly placed in the spacious room, pushed into a corner and backing onto a curtain that covered the passage to the kitchen.1 There was a reason why they were in the corner. Next to the curtain was a glass door to the dining-room which, six years before, had been turned into a bedroom for the artist’s invalid sister. Whether sitting in the corner or standing at her easel Grace was positioned to hear a call from Diddy in the adjacent room. Cossington Smith told Alan Roberts her sequence of work in the later paintings. First the subject, the idea of which had to arise, as she said, ’with a fresh feeling’.5 ‘I see something which I like and then I just decide how much I am going to do of it. Then I have to decide on the central part … – the guide to the whole painting – and the other part [the rest of the composition] has to fit in with the first thing.’6 She began work by sketching the bare outlines of the composition in charcoal.7 After which, with ’the enjoyment of a full brush’8 in square touches she painted the lightest part of the subject,9 thereby ensuring that light itself provided the key for the tonal order of the whole work. Sofa in the Corner would have begun with the sofa, wall and one of the cushions, the artist then brightened the colours and deepened the tones (only fractionally) across the image, before concluding with an enlivening tonal leap to the darkest tone (a green cushion). Light is sustained across the whole work by a crisp white ground that shows between and behind the colours. 1. Information about the layout of the house is from Daniel Thomas’s formidable research for Grace Cossington Smith, Art Gallery of New South Wales, Sydney, 1973 and David Moore’s 1978 photographs of the interiors and garden of the artist’s home, Cossington, Turramurra. The corner is shown is greater detail in Sofa in the Room, 1960, illustrated in Sotheby’s, Sydney, 27 August 2001, lot 10. 4. Around 1926 the artist copied the coloured diagram that was the frontispiece to Beatrice Irwin’s The New Science of Colour (first edition 1916, many subsequent editions, Cossington Smith’s of 1923). She kept the diagram and seems ever after to have derived from it suggestions for effective colour schemes. See Bruce James’ and Deborah Hart’s monographs for a discussion of the influence on her of Irwin’s book.